Paul didn’t write those words lightly. Persecution is heavy in those days. There was government persecution and the fear of crucifixion. The empire ran the region with a heavy hand. One dare not speak anything even remotely resembling treason lest one’s life be forfeit. The was also local persecution, a persecution of a more private type. There is record in Acts of how this happened in Ephesus. If you bring a message that affects the area’s economics you can be certain that the merchants will be upset. At a minimum. And if the economy is tied to a theological alternative then the persecution will be as religious as it is economic. In all of this the Christian was told to honor the Emperor and to give honor where it is due. This is an undemocratic proposition. There is a recognition of class, both politically and economically. Though the church would be internally near-egalitarian in some (but certainly not all) regions its relationship to external entities was far from pursuing the same structures within governing authorities. There is a sense where we see a functional two-kingdom system coming about through the eyes of a one-kingdom theology. What does that have to do with us today? 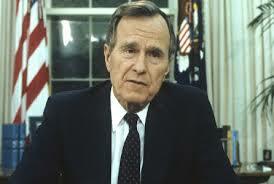 President George Herbert Walker Bush has passed on to his reward. We leave him in God’s hands. That’s all we can do for anyone. The elder President Bush served his country honorably. He was one of the last high-ranking WWII veterans, even a war hero. He was a progressive but of a softer type than what we see today. As a progressive he wanted a better and more peaceful world and he worked toward that end. His “thousand points of light” and emphasis on volunteerism reinforced that goal. His progressive attitude came out when he talked about the “new world order,” a phrase that struck a note with those who watch international affairs with a skeptical eye. They saw the culmination of Wilsonian policy in a one world government. He was taking a more low-key approach and would work toward global governance rather than global government. He saw and even participated in the direction of a more peaceful world. It was President Reagan who said “Mr. Gorbachev, tear down this wall” and it was President Bush who oversaw the collapse of the eastern bloc and the Soviet Union. These are not things that any Democrat ever worked to accomplish. He was a skilled politician and was instrumental in the formation of an organization called Citizens United. The Democrats still have not forgiven him. He understood the media bias issue. During his campaign against Bill Clinton one of his campaign bumper stickers began with “Annoy the Media ….” As a result he managed his message as best he could given the MSM tendency to filter or silence those they oppose. The result was his “kinder and gentler” framing of Republican social policy. He had a tough time getting the message out. He was a good sport when Dana Carvey would imitate him on SNL. “Wouldn’t be prudent” still rings loudly on some days. The Democrats did get even with him. Since the Republicans did not control either house during his administration his “read my lips” was taken as a battle cry by the Democrats. He gave in and it cost him the 1992 election. Of course we are free to disagree with much of what he did. Some of it was highly questionable. Like time that he had a group of homosexual leaders at the White House for dialogue. Then, after being criticized for it, proceeded to find a cause for national prayer. It seemed to me a way to placate the evangelical and other Christians who were criticizing his move. It was civil religion as a way to manage people. Not his finest moment. Yet we honor him for his selfless service and his strong family life.